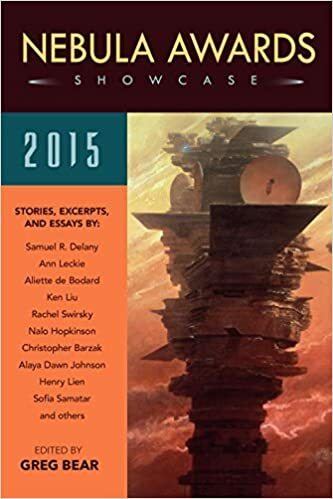 The Nebula Awards Showcase 2015, edited by Greg Bear, features some of the short stories, poems, and longer work excerpts selected for Nebula awards. The awards have been around for over six decades and, at this point are one of the most highly recognized and lauded in the SFF community. Included in the collection are such authors as Nalo Hopkinson, Sofia Samatar, Samuel R. Delany, and more. Admittedly, my expectations for the showcase were high. And for the most part I was impressed: by the range of pieces included, the talent of the writers, and some particular standouts that floored me. Of the stories that I was most drawn to: each held an edge of melancholy that I only noticed upon rereading. One of these, Christopher Barzak’s “Paranormal Romance,” about a not-your-ordinary-witch who specializes in love magic and yet can’t seem to find this same ability for herself sounds like a clichéd premise. However, Barzak elevates it to a funny, sweet story which charmed me in a way that I don’t often expect fiction to; but, at its heart, it is also about loneliness and the feeling of not being able to connect. Another, Sofia Samatar’s “Selkie Stories are for Losers,” also dealt with feelings of missed connection, loss, and the inability to fully voice what’s inside. In this piece, the narrator’s mother was a selkie who abandons her family upon the rediscovery of her skin. The metaphor behind this seems obvious, but it’s the way Samatar fills her narrator with the same problem on a human scale—not ever feeling entirely comfortable, or completely truthful, in her own skin—that makes the story’s emotional impact. My favorite story, though, was the devastating “Alive, Alive, Oh,” by Sylvia Spruck Wrigley. I’d never heard of Wrigley before, but will seek out more of her work. The story, about a mother trapped on a research mission that her family can never return home from, is at once heartbreaking and beautifully imagined. As a story about the things we leave behind and the ways we desperately try to recapture them, it felt like a darker, more true, form of nostalgia—one with consequences. However, remember how I said that I was for the “most part” impressed? I have to admit to feeling that several of the pieces fell flat for me. There also, other than the speculative nature of the pieces, was not much in a cohesive thread through the stories. While this seems like a consequence of it being an award showcase, I still feel like something like The Best New Horror collections still always feel fairly unified. And, of the pieces, I wasn’t particularly drawn to: I was most surprised by how much I didn’t particularly enjoy the Nebula’s short story winner—Rachel Swirsky’s “If You Were a Dinosaur, My Love.” While Swirsky’s writing has some lovely phrasing, the brevity and structure of the piece distanced me from the story’s emotional core—ending with the story feeling more maudlin than mind-blowing. Overall, with some great pieces and some misses, it’s definitely worth a read as an example of the current state of SFF.